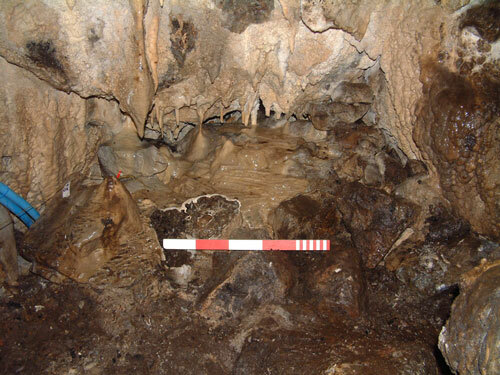 Music, archaeology and the latest news from High Pasture Cave….. In celebration of John Purser’s seminal publication on ‘Scotland’s Music: A History of the Traditional and Classical Music of Scotland from Early Times to the Present Day’, Feis an Eilein hosted a special event at High Pasture Cave on the 12 July. John presented and demonstrated a range of instruments relating to ‘The Beginning of Scotland’s Music’. 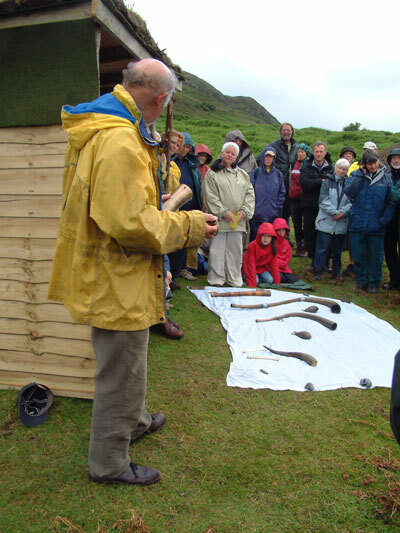 Although the weather was slightly damp, the event was well attended and the site resounded to the sound of Late Bronze Age horns and other instruments from the early phases of Scotland’s musical history. 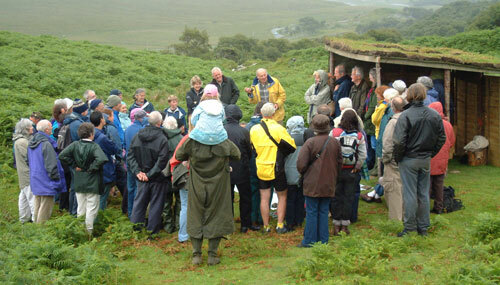 Thank you to John and the Feis for putting on such an interesting event at the site. 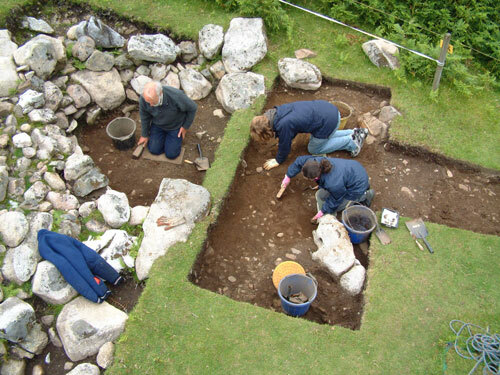 Aided by additional volunteers at the site throughout the month of July, work at the site has progressed well. I will describe the main findings from the site by trench. Trench 15 becomes a deeper and more complex excavation with time. Martin and the team have revealed additional features in the trench that have been buried for over 2500 years by layers of ash, charcoal and fire-cracked stone. 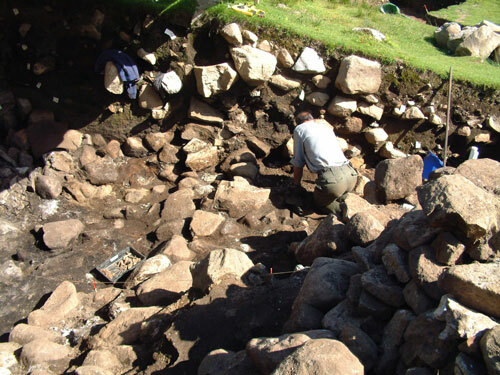 The image above shows Martin excavating the deposits surrounding the base courses of the stone revetment wall, to the south of the cave/stairwell entrance. Some nice lumps of charcoal and a few fragments of animal bone have been recovered here, but few small finds. 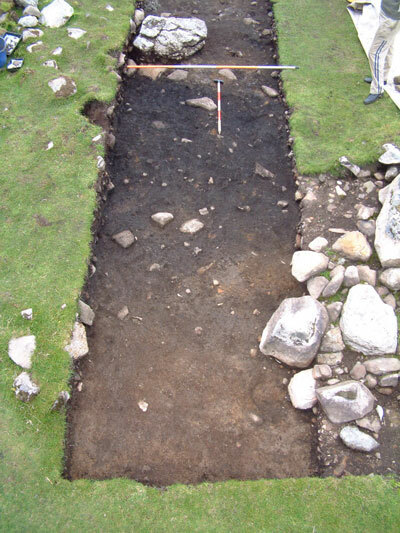 To the left of the image, Martin and the team have also been excavating the large slab-built hearth setting described in the last news update. Below the slabs they uncovered more layers of ash, significant quantities of processed animal bone including pig, cattle and red deer, and a few small finds including coarse pebble tools (grinders and pounders), a spindle whorl, a fragment of a bone pin and a large fragment of a finely worked shale or cannel coal bracelet. 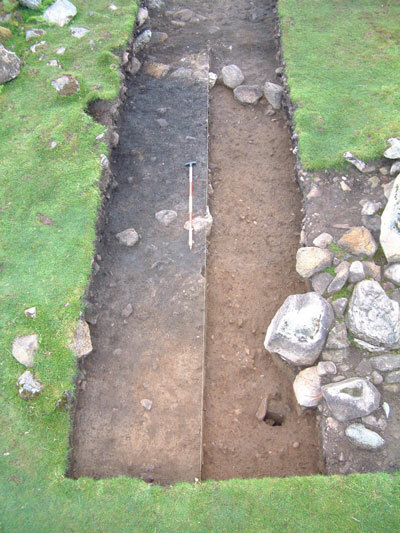 After the main foundations of the revetment wall had been removed, what appears to be another phase of wall was uncovered at a lower level, along with a pile of finely worked slabs (see image above). The slabs, stacked at the north end of the trench, also have a short linear wall running off them, which will be investigated over the coming weeks. 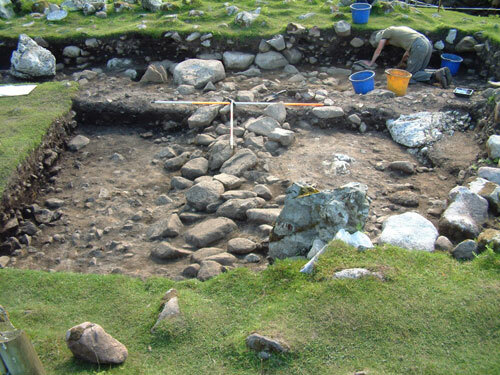 Other features at this level include possible areas of paving slabs and what may be the remains of another hearth setting - all of which will be revealed over the next week of excavations on site. Work has also progressed well in Bone Passage with the removal of a significant amount of stone and sediments, the latter 100% wet sieved. Some of the deposits contained significant amounts of periwinkles (shellfish), animal bone (primarily pig), red deer antler and some burnt grain (barley). 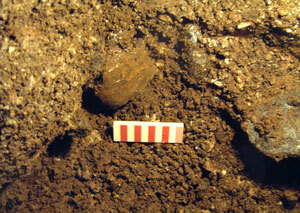 Small finds here included a few sherds of Iron Age pottery and two small iron concretions. The image above shows the area of the excavations at the north end of Bone Passage, adjacent to the calcite grotto where the passage turns downslope to the right to meet the main stream passage of the cave. At a lower level in the archaeological deposits finds were few, with just some isolated animal bone dispersed within these water-washed sediments. Excavation in the cave uses both the installed lighting in this part of the cave and the headlamps mounted on our caving helmets (see the image of George above). The deposits contain significant amounts of stone including limestone from the passage walls and roof, and granite and fire-cracked stone introduced from the outside. During excavations in the water-washed gravels George recovered quite a few pottery sherds including some large and ‘fresh’ pieces. Some of the smaller isolated sherds are well fired and comprise decorated pieces (chevron designs of possible Late Neolithic or Early Bronze Age date) and what may be a few smaller fragments of All Over Cord Beaker. 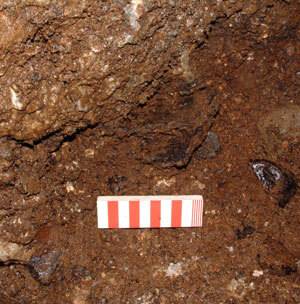 This material may relate to some of the earliest deposition of material in the cave at High Pastures. The image above shows a base sherd from quite a large flat-bottomed pot (scale = 10cm) lying within the coarse and gritty gravel deposits between two limestone boulders. This deposit also included a small stack or cache of large pot sherds, from the same vessel, which has a slightly rounded rim and is undecorated (see image below - scale = 10cm). The stack of sherds in this location (within what we thought were water-washed and disturbed archaeological deposits) is interesting - how did the material arrive in this context? Was it placed there? If so, this pottery may also be of early date. The third major trench we are progressing at the moment is Trench 19, for which we provided details on the last news update. 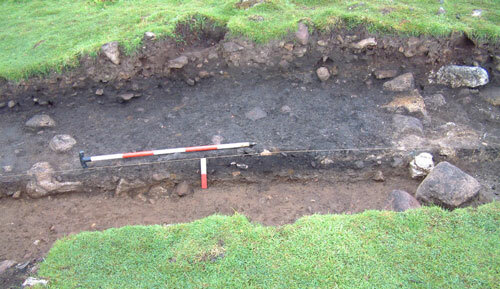 Finds have been few within this trench, especially at the level of the burnt mound, although several pebble tools, a whetstone and charcoal and bone fragments have been recovered. However, the excavations are providing details regarding the re-distribution of fire-cracked stone, ash and charcoal - most likely from the hearth settings uncovered in Trench 15 - and is also providing a few interesting features at lower levels. In the eastern sector of Trench 19, an area comprising much darker and organic-rich deposits was identified running in a SW - NE direction. Thinking that this may be a pit or ditch feature, we decided to run a section through it and remove one half of the deposit. The image above shows the feature from the east after initial cleaning of the surface and removal of the overlying burnt mound deposits (scales = 2m and 1m), while the image below shows the feature after section excavation. The organic-rich deposits contained significant quantities of burnt bone, charcoal lumps and peat-ash; but no small finds (although a soapstone spindle whorl was recovered from the upper portion of this deposit - see last news update). 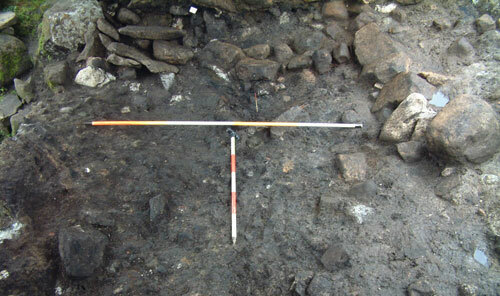 During the section excavation, Steven found that the black deposit ran up against a low revetment wall to the west, while it lensed out to the east. No ditch or pit was recovered below the deposits, so it appears that the material is purely a context within the wider sphere of depositional events that have taken place in this part of the site. 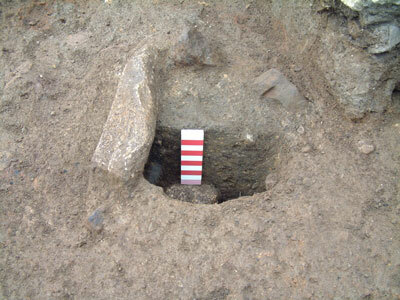 However, during excavation of the material at the east end of the trench, a small post-hole was uncovered (see in image above) complete with small packing stones. The image above shows the completed section with the black organic deposit visible and the single course revetment wall to the right in the image (scales = 1m and 0.2m). The post-hole was also sectioned (see image below - scale = 0.1m). During the next few days we will remove the other half of the deposit and see if this reveals additional features. We are still removing the lower deposits of the burnt mound in other areas of Trench 19, which will hopefully reveal more features. In the northern sector of the trench we have uncovered what may be the remains of a tumbled wall (see image below), which requires further investigation. We have recovered no finds as yet from this feature, but Michiel Peterson did find a sherd of decorated pottery at the inter-face of the lower burnt mound and the natural clay below. The sherd is abraded, but it does appear to be from an All Over Cord Beaker. If this preliminary analysis is correct, then this adds to our small collection of possible beaker pottery fragments, which would be a very important development at the site as this type of material is quite rare, especially in a non-funerary context. Work is also progressing in Trench 20, which was established to further investigate the small unusual structure revealed in Trench 19 and to evaluate potential archaeological deposits in what may have been the main entrance into the High Pastures site. Up to now the trench has revealed re-deposited fire-cracked pebbles, which may have been laid down as cobbling in the entrance-way. 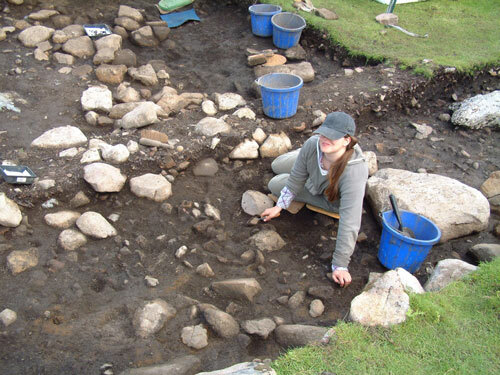 The image above shows the cellular-type structure in Trench 19 (Roddy excavating), from which we have recovered no finds by which to date it, and the west end of Trench 20 with Ian and Rachel excavating. Further work is required in this trench over the next few days.